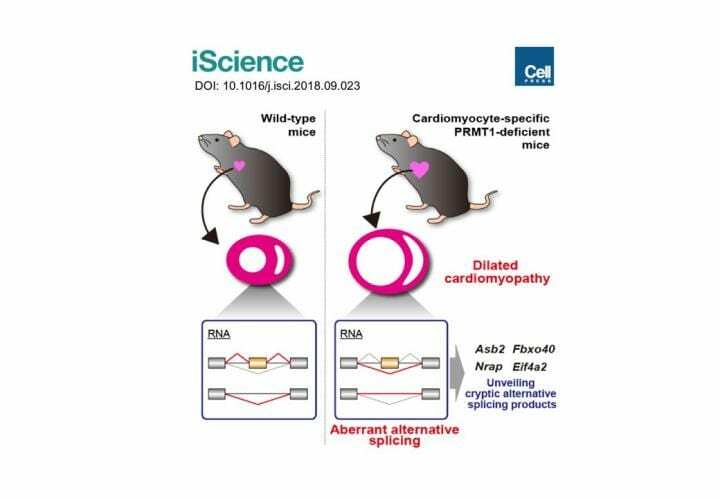 In a study published in iScience, Professor Akiyoshi Fukamizu of the Life Science Center for Survival Dynamics, Tsukuba Advanced Research Alliance (University of Tsukuba, JAPAN) and the research group reported a new work on discovery of the important role of PRMT1 in dilated cardiomyopathy (DCM). The heart pumps blood to all organs and tissues of our body that need the oxygen and nutrients it carries. In the United States, the mortality rate due to cardiomyopathies is greater than 10,000 deaths per year. On the other hand, in one of the most common types of heart disease, DCM, the heart (cardiac) muscle enlarges and weakens, preventing the heart from pumping blood efficiently. Moreover, at the time of listing for heart transplantation, the median age is 4 years (Ref. 1), and approximately over 10% of children affected with DCM have died at age 2 (Ref. 2). While it is known that mutations in the alternative splicing regulator RBM20 gene have been shown to cause human DCM (Ref. 3), genetic information such as gene expression and alternative splicing related to DCMs remains unidentified. Arginine methylation is a posttranslational modification of proteins, and is catalyzed by protein arginine methyltransferases (PRMTs). PRMT1, a major methyltransferase active in mammalian cells, regulates various cellular functions such as gene expression, DNA replication, and cell proliferation. It is of note that these functions were identified by experiments with culture cells, while physiological roles of arginine methylation have been largely unknown. Recently, a number of studies have suggested that abnormal mRNA splicing is related to the pathogenesis of DCM; however, its regulatory mechanisms are largely unknown. "Our findings may become a breakthrough for understanding the mechanism of DCM," says Akiyoshi Fukamizu. "DCM has serious prognosis, especially in cases of patients at young ages, including infants. We hope our study will benefit the development of new treatments for DCM patients."